All large-leaf trees are losing leaves or at least having the leaves burn and turn yellow. It may be showing up stronger this year because of the cool and super-wet spring. It's basically an adjustment in the transpiration system of the tree. When it's extremely hot, plants can lose more moisture going out from the leaves than the root system can pull up from the ground. Thus the tree adjusts by releasing foliage. Instead of watering a certain number of gallons, flood the root zone well and then wait as long as you can without the tree wilting before watering again. Your tree should be fine. It is more serious if the leaves are turning brown and sticking on the tree instead of falling off. 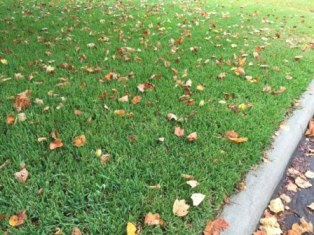 On the watering issue, keeping trees too wet can be as damaging as allowing them to become too dry. Use a probe to test the soil - don't just guess. 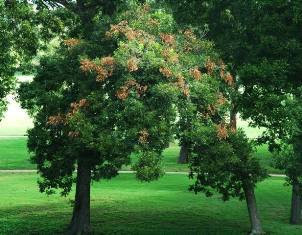 Another cause of brown leaves in trees is animal damage. The photo above shows a common scenario – squirrel damage. It happens most commonly in pecans but also appears in other tree species. It can’t be totally eliminated in some cases but can be greatly reduced. Some advisers say that animal damage to trees is a random thing and there's nothing that can be done to prevent or cure the problem. 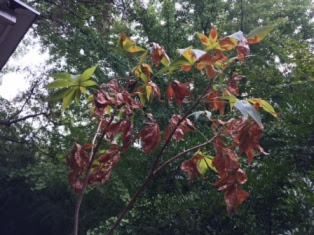 Whether it is rodent damage to Japanese maple bark, sapsucker damage to redbuds or squirrel damage to pecans, trees are being attacked mainly because they are in stress. Stress can result from several factors, but the solution in all cases is the Sick Tree Treatment. The most common cause is the trunk flare being buried in the ground rather than properly exposed above grade (watch Understanding Root Flare) .